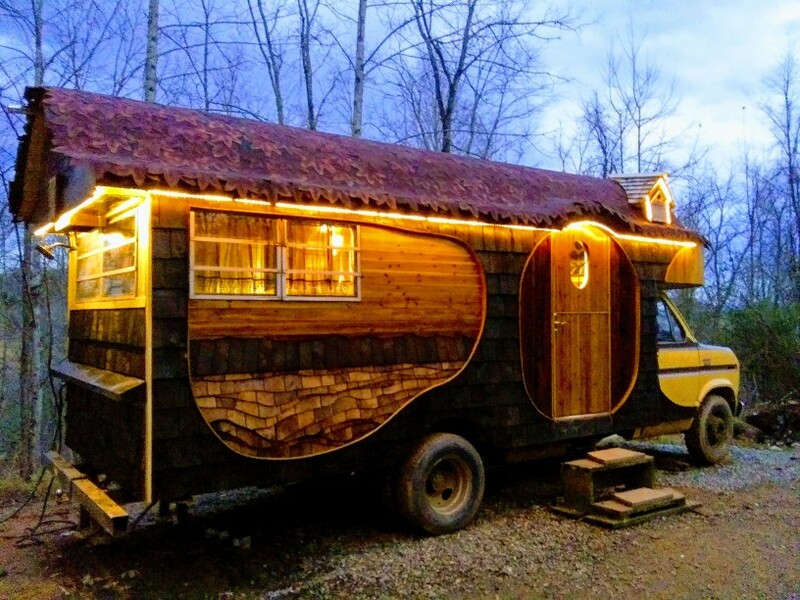 After coming across an old, beat-up Coachmen RV while on a long section hike of the Appalachian trail in northern Virginia, Justin decided to buy the RV and turn it into a home on wheels. 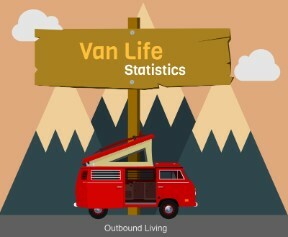 With 20 years of high-end woodworking experience, and almost 10 years of experience living the van life, he was able to dive right into the project with little planning needed. 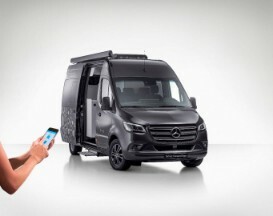 The RV has a hobbit style exterior which comes from his passion for adventure along with his desire to explore New Zealand in the near future. The shape of the roof and dimensions come from sacred geometry, a theme in all of his work. 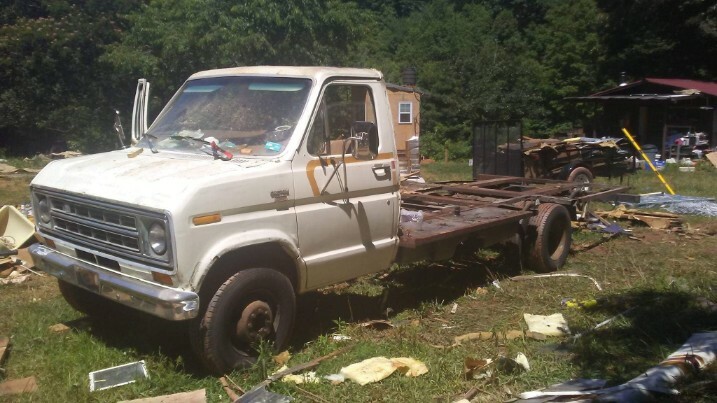 He wanted to create a piece that would sit harmoniously with nature wherever it ended up being parked. 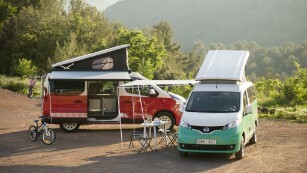 The RV is not intended to be driven all around the world. 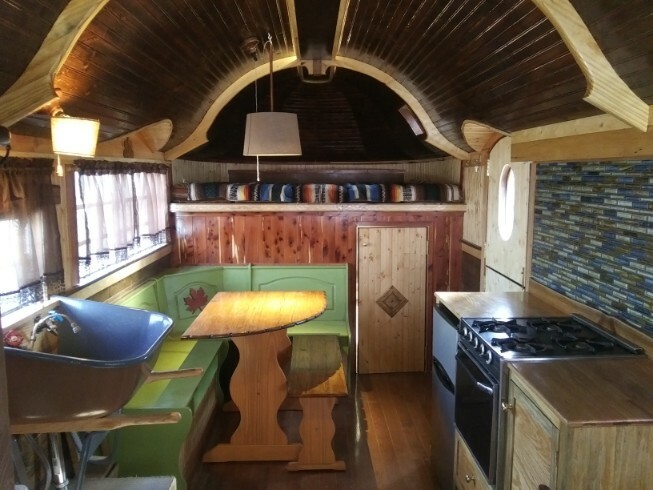 It’s more so intended to be used as a vacation rental/airbnb. He sees it best used as an interactive functional art piece with a rotation of guests being able to take it in, as it takes them in. 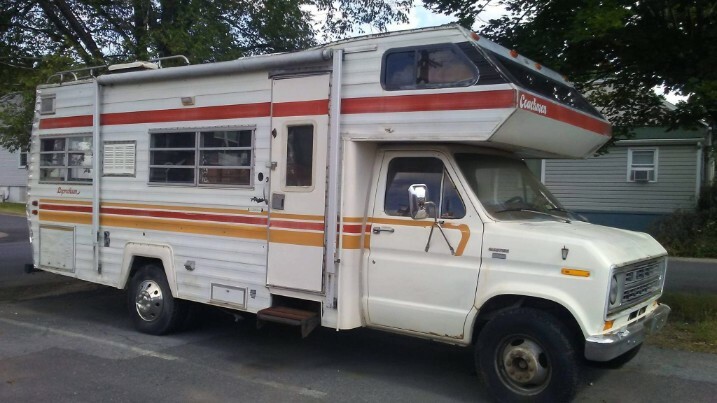 While it isn’t meant to be used as a world traveling RV, it’s been rebuilt with a Ford 400 big block engine with many new parts and new tires, so it drives quite well. Justin really poured everything he had into the build, taking him a year to complete, working seven days a week. 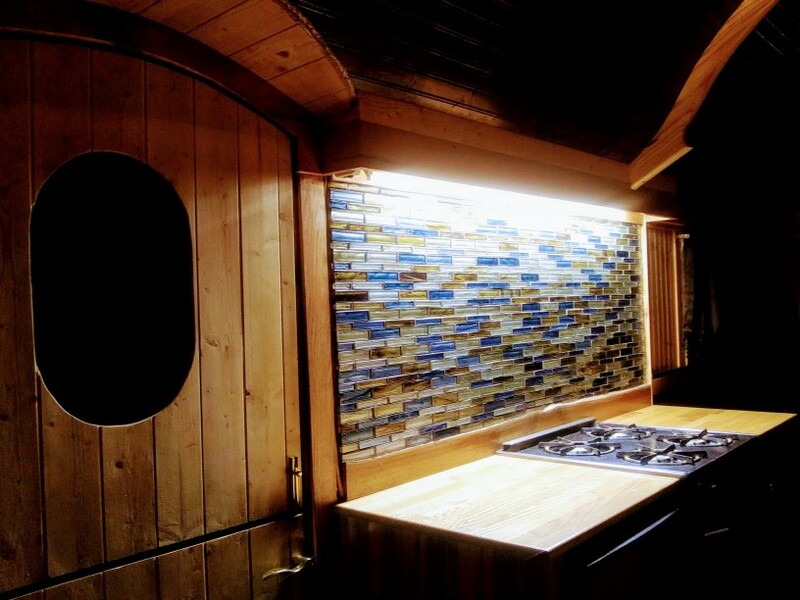 The most incredible feature of this RV conversion is the wood fired hot tub. 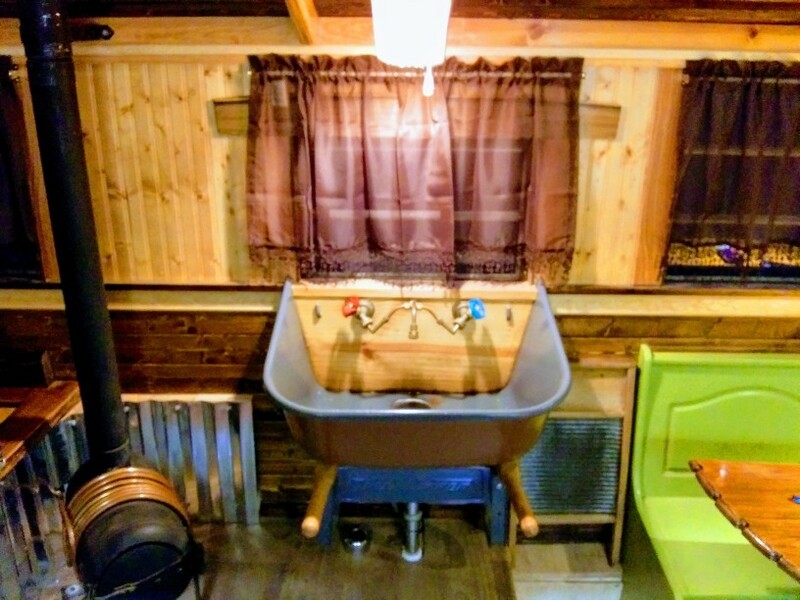 The hot tub is a deep 4′ long horse trough connected to a small custom made wood stove by copper pipe. A coil runs around the stove and a pump circulates hot water back into the tub. A switch manually controls the temperature as desired. When it gets too hot you can simply turn off the pump. This gives you more control than a typical wood fired hot tub that keeps on heating depending on the fire kept. 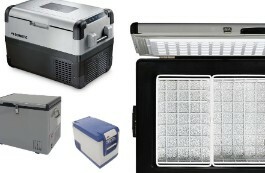 The stove can also be used independently as a means to heat the whole RV. 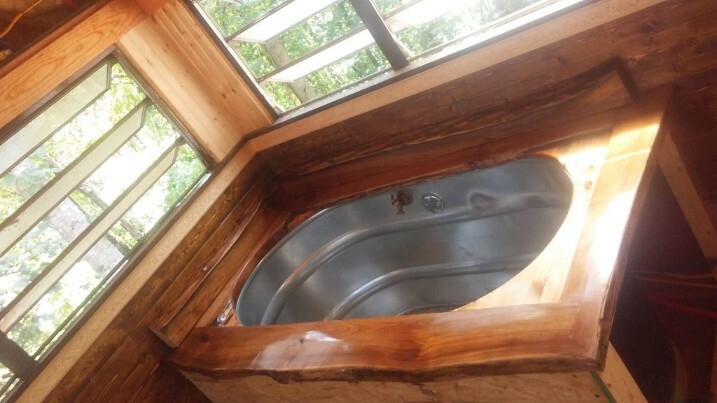 An oval shower curtain ring above the wood fired hot tub turns it into an open concept shower as well. Off the back of the RV is an outdoor shower plumbed from the high capacity on demand hot water heater. The wheelbarrow sink is split in two but installed to appear as if pushed through the wall, with the front outside serving as a flower box. Justin made the faucets for the sink and rub himself from garden spigots and copper fittings. Justin replaced the passenger seat with a custom composting toilet that can turn making the front cab of the van into the “outhouse”. 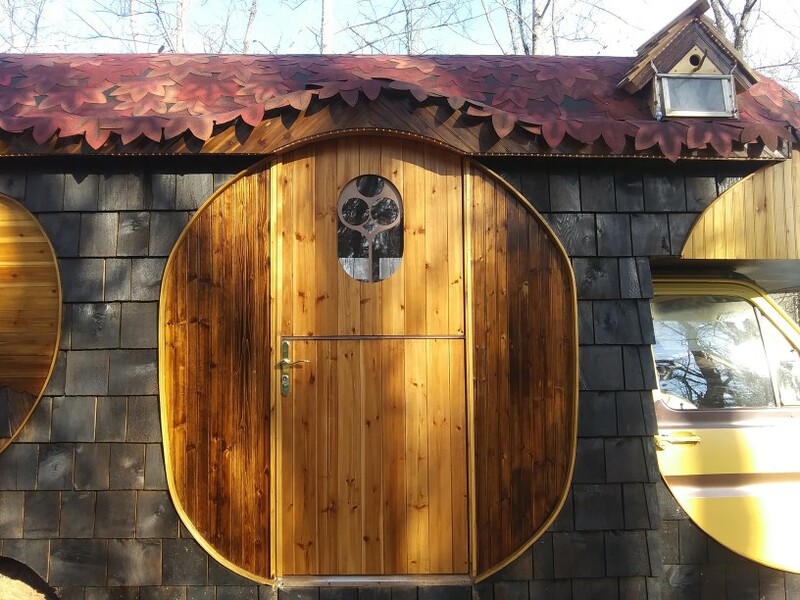 The small wood door leads to the composting toilet, where the passenger seat was previously. 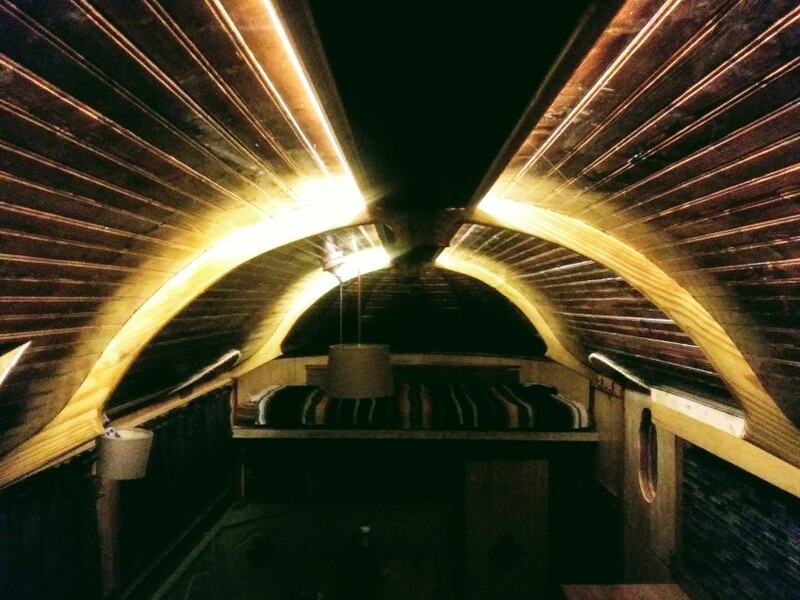 A light cove is hidden along the interior beam to illuminate the stained tongue and groove pine ceiling. 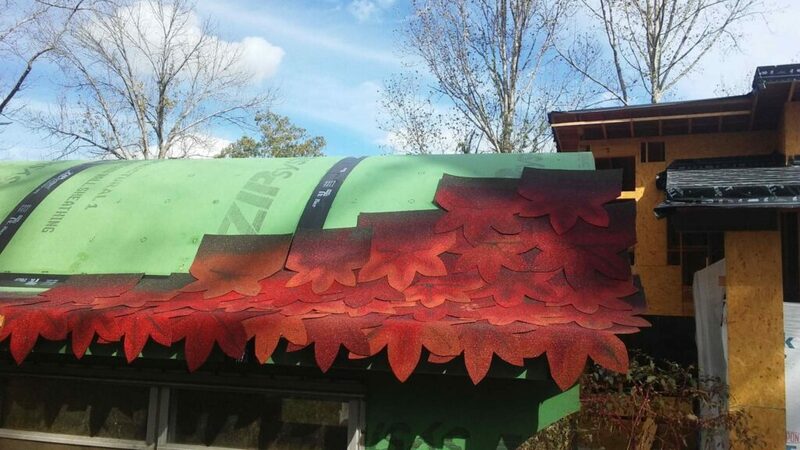 To make the roof, Justin cut, painted, and installed hundreds of fall foliage maple leaf shingles to create the hobbit tree house look. 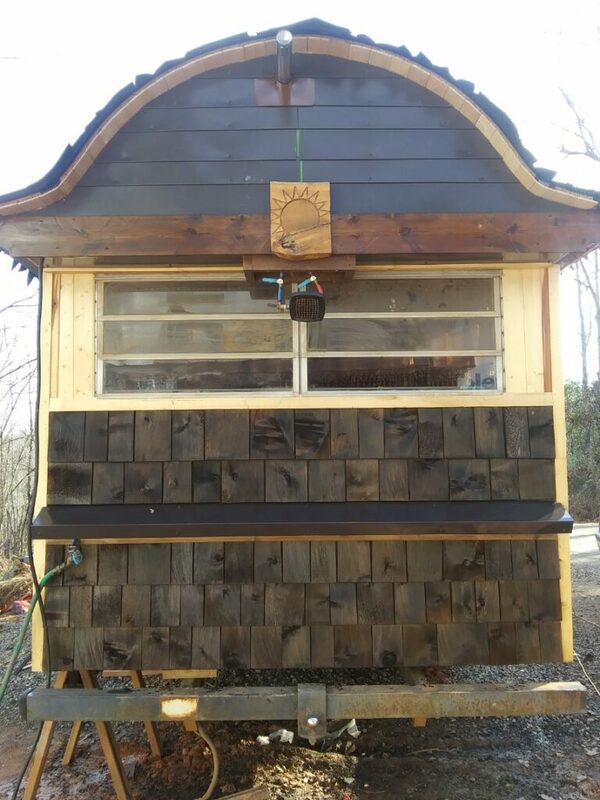 The cedar shingles were oxidized with a solution of steel wool and vinegar to give it an aged look. 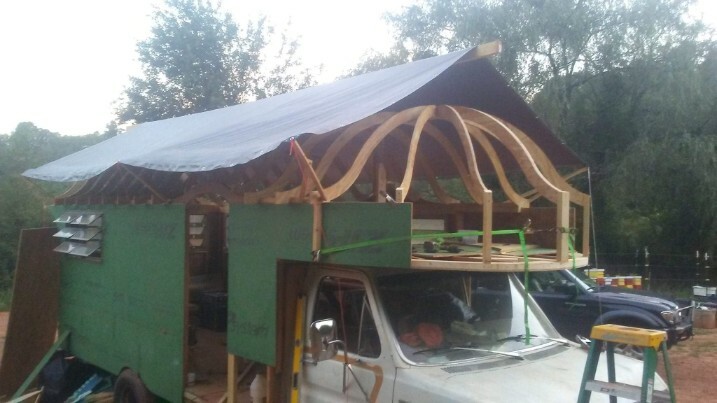 With the exception of the structural sheathing used as a substrate, Justin avoided using plywood in his build. Justin ensured that the tiny home was heavily insulated. 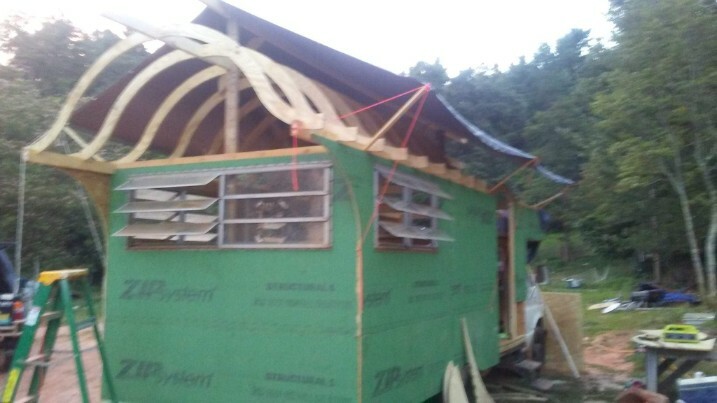 He used closed cell spray foam in the ceiling, and rigid foam glued into the walls creating structural insulated panels adding strength to the build. 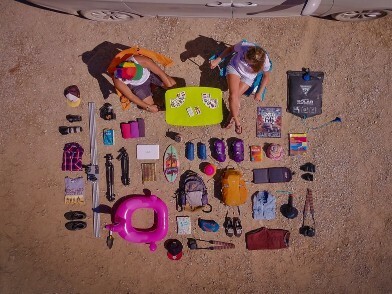 For sleeping arrangements, the RV can fit five – two in the loft, two on the futon, and one on the hammock. 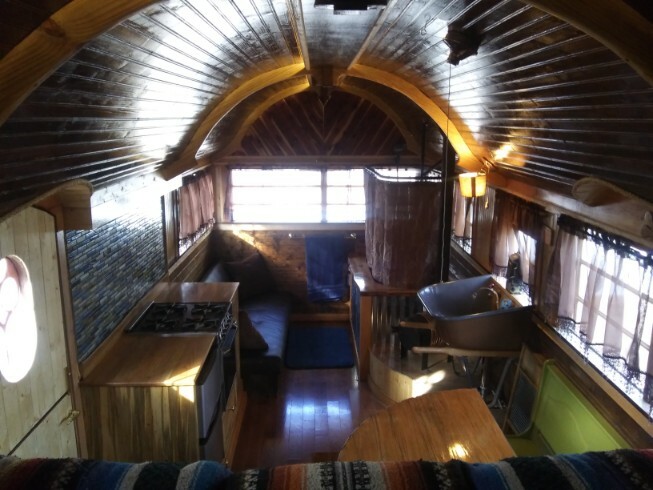 Justin is selling his converted RV, or auctioning it off nationwide to the highest bidder. He expects the bidding to exceeds $100k. If you’re interested, you can check out his Facebook page or if you’re in the Marshall, NC area, you can stop by his place.